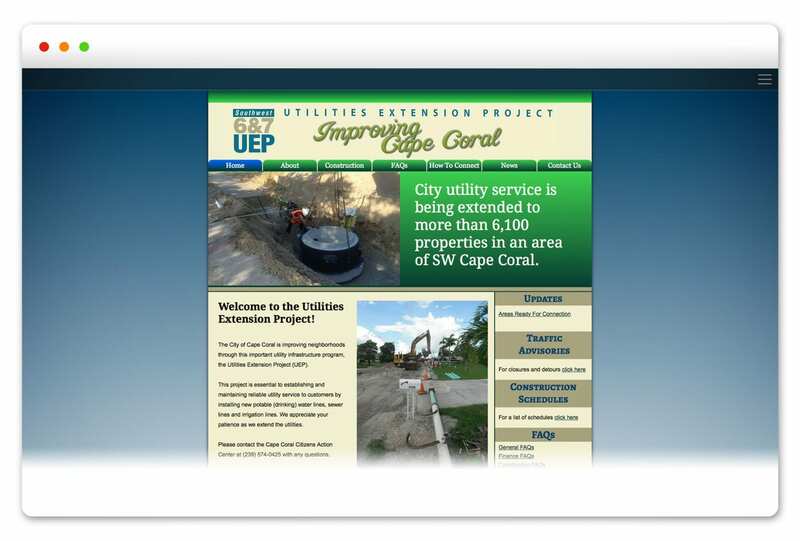 In October 2012, Estero, FL-based Tetra Tech, the engineering firm of record for a massive Utility Extension Project (UEP) in Cape Coral, hired the Agency to perform ongoing public outreach activities to keep the residents and others updated on the status of the project. The UEP would bring City utility service to more than 6,100 properties in an area known as Southwest 6 & 7 in the southwest section of Cape Coral. The focus is establishing and maintaining reliable utility service to customers by installing new potable water lines, sewer lines and irrigation lines. The Agency designed and developed a website, door hanger notices that would alert residents as to when the roads in their neighborhoods would be under construction, signage and an informational piece for public update meetings. Other activities we proposed in the scope of work included social media posting and management; ongoing public outreach meetings; direct mail postcards; news media update days; and roadway monitoring and photography services. While Spiro & Associates assisted with the first public presentation, the scope of work was modified whereby our services were required exclusively for website updates, including traffic advisories, and an updated design as time went on. In early 2016, the project is substantially complete, and our services have kept the public updated via website communications. The Agency is in the process of relinquishing control and maintenance of the website to the City of Cape Coral.